The DCEU will continue to grow next year with the highly-anticipated debut of David F. Sandberg’s Shazam! on the big screen. There’s a lot of fan anticipation to see what will happen when this decidedly lighter adventure joins the darker superhero universe, and the cast has become a particularly interesting element to watch. Though the film recently finished shooting, it looks like we now have some exciting casting news, as it turns out that Djimon Hounsou will appear in the movie as the Wizard. Per a report from EW, it looks like Blood Diamond star Djimon Hounsou will appear in Shazam! as the Wizard who grants Billy Batson (Asher Angel) the powers to turn into the titular hero (Zachary Levi). Hounsou has apparently been cast for quite a while (as production on Shazam! has already been completed), but his involvement in the movie had not been made public until now. Previously, it had been reported that This Is Us star Ron Cephas Jones had signed onto Shazam! as the Wizard (and some fans had even begun making fan art of the actor in the role), but Jones ultimately had to turn down the part due to scheduling conflicts. Ironically, this is the second movie that Djimon Hounsou has signed on for with a lead character who goes by the name of Captain Marvel — though it’s worth noting that we don’t know if the Captain Marvel moniker will pop up in Shazam! The Gladiator actor is also set to reprise his Guardians of the Galaxy role, Korath, in Carol Danvers’ upcoming solo movie. That film is set to debut in theaters less than a month before Shazam! premieres, so it looks like Hounsou is going full Josh Brolin in his ability to work in multiple superhero franchises at once. Shazam! tells the story of a young orphan named Billy Batson growing up in the DC universe. A scrappy and streetwise kid, Billy eventually meets a Wizard who grants him the powers of the Gods of Olympus and allows him to turn into a muscle-bound hero by yelling out the name “Shazam!” In addition to the aforementioned members of the cast, David F. Sandberg has also enlisted Green Lantern veteran Mark Strong for the villainous role of Dr. Sivana, as well as several young actors to portray Billy’s foster family. 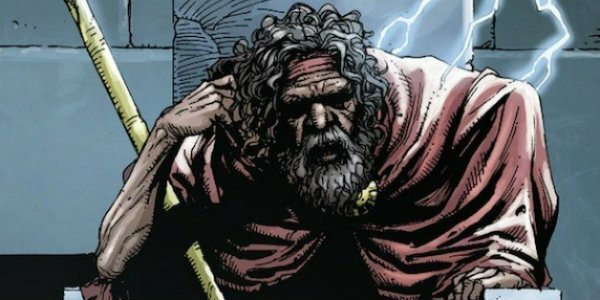 Audiences will get a chance to see Djimon Hounsou as the 3,000-year-old Wizard when Shazam! hits theaters next year on April 5, 2019! Make sure to keep it here for more updates related to Shazam! as they become available to us and watch out for this year’s release of James Wan’s Aquaman, which will premiere on December 21.